Delicate gold beadwork and paiettes accent the choli top and the sides of the open harem pants of this delightful set from Turkey. Made of wonderful stretch velour. This one is pure comfort! 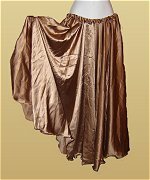 Beautiful, radiant full skirt with closed side seams. Lovely semi-circle chiffon veils edged with metallic trim. Calvary style sword comes with velvet scabbard. Silver blade with gold-tone handle. Choose from red, blue or black velvet scabbard. Balanced scimintar. Silver blade with gold-tone handle. This sword comes already balanced. Price includes a soft velvet cover for the blade (available in red, royal or black). 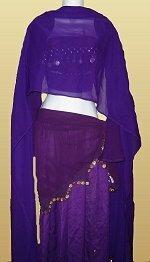 This lovely skirt is 3 layers of beaded panels. 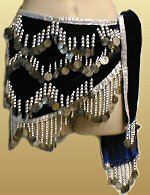 Beautifully beaded and sequined skirt makes an elegant addition to your dance wardrobe. These lovely skirts are adorable. Wear them over another skirt, harem pants or just a untard. A comfortable and affordable addition to your dance wardrobe. Another version of the petal skirt. This one features alternating panels of sequined and sheer fabric. The Bitty Bell Bracelet. Make it a set by adding the Bitty Bell Anklet as well. Soft and flowing chiffon veil. Most veils measure 45"X108". This simple yet lovely bracelet is a perfect complement to your costume. Makes a great gift for students and friends too!